Ride your ATV worry-free. With Florey Insurance Agency, you can get free ATV insurance quotes and advice that will help you find a policy that’s right for you. 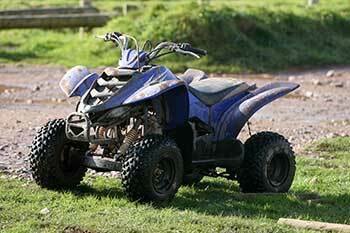 Homeowners policies often provide only minimal coverage for ATVs. Get peace of mind by talking with an ATV insurance agent who can provide free ATV insurance quotes and guide you on the type of policy that will properly cover you and your ATV. You may qualify for additional discounts if you own more than one ATV or have a safe driving record. Contact your independent ATV insurance agent for an ATV insurance quote and help customizing your policy. Why isn’t my homeowner’s policy a good place to insure my ATV? The typical homeowners policy provides only minimal ATV coverage. And if you take your ATV off your property to camp, hunt or ride, it may not cover you at all. Your ATV insurance agent can help ensure you get the coverage you need. How can I keep my ATV insurance rates low? Get ATV insurance quotes – Shop around. Florey Insurance provides free ATV insurance quotes that will help you compare rates. Ride Your ATV Carefully — Maintaining a clean driving record and avoiding accidents can help keep your ATV insurance rates low. Choose Your ATV Carefully — ATVs with larger displacement engines, as well as those that are considered more aggressive machines, typically cost more to insure based on the history of claims for those vehicles. Insure all of your ATVs — We have a company that offers discounts on policies with two or more ATVs.